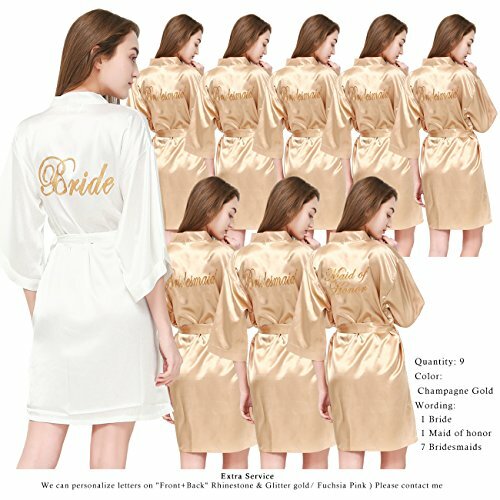 Welcome to PROGULOVER, We are proud to offer our line of Bride robe,Bridesmaid Robes,Bridesmaid Gifts,Mother of the Bride Gifts,Mother of the Groom Gifts,Satin Robes,Bridesmaid Pajama Sets,Bridesmaid Nightgowns,Satin Night Gown and so on. We are so honored to get to do what we love each day,Making your Memories!We love that we get to be a part of so Many Weddings and Special occasions. If you have Any Questions Please do not hesitate to send us a message,we are always happy to chat with our Customers and offer guidance in personalized detials or any other questions you might have. I've tried to represent the colors as accurately as possible,as different computers display colors differently,the color of the actual item may very slightly from the above images,thanks for your understanding. Washing before wearing is not absolutely necessary.Just steam or iron on low heat to remove wrinkles. If you feel you need to wash them,please hand wash or machine wash on cold gentle cycle(Best hand wash). Last rinse with a fabric softener will make the robes more lively. Made of high quality satin so the robe is lightweight, comfortable and you will feel like wearing an expensive silk robe.